Avathara sthala of udayanangai, Nammazhwar's mother. Udayanangai and her husband Kari observed penance for 41 days and the Lord bestowed them with a son, who became the Prapannajana Santhana Kootastar of Sri Vaishnava Satsampradaya. As per the stahala purana, Lakshmi was taken aback by seeing the Ugra(Ferocious) swaroopa of the Lord after slaying Hiranya and performed tapas. The Lord took His normal pleasant form at the request of Prahlada and came in search of Lakshmi here. Lakshmi became very happy and took her rightful place in the heart of the Lord. Hence the Lord here is called Tiruvazhmarban and place called Tirupatisaram as the Lord resides here. Approach : This temple is located at around 4 kms from Nagarcoil on Nagarcoil-Trivandrum Road.Moderate facilities available near the temple so it better to stay either at Nagarcoil or Thirunelveli and visit this temple. The Kshetra is the birthplace of Udaya Nangai (mother of Nammazhwar). The Lordess (Lakshmi) stands on the left side of the sri roopa of the Lord. 2 Miles before Nagercoil as from Thirukkurungudi or Nanguneri. Accessible from Nagercoil also. 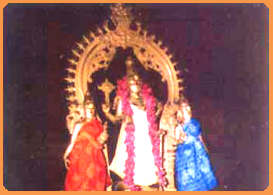 The Moolavar of this sthalam is Thirukkuralappan. He is also named as "Thiruvaazh maarbhan". Moolavar in Veetrirundha (sitting) thirukkolam facing his thirumugham towards East direction. Prathyaksham for Vindhai, Kaari, Udaya Nangai and Garudan. This Divyadesam, Thiruvanparisaram is also known as "Thirupathisaram" and lies around 3 kms away from Nagarkoil.